“You don’t actually think this is going to work, do you?” Anon scoffed at King Blackthorn’s suggestion. As Heckles approached, he unwrapped it and held the sheathed blade out to Sir Dupre, and he drew it…to show a brilliantly gleaming black longsword, with magical runes engraved along it’s length. The balance was impeccable, and it felt as if it had the perfect weight…He gave a small swing of it’s blade, and saw the same motes of magical energy as Shanty’s Sharkbite had cast. In a deft motion he sheathed it perfectly, and gave the King a nod. Anon’s preparations were complete and he’d taken a score or more of obscure reagents from the depths of Blackthorn’s vaults; Dupre had replaced his shield with a heavier version and had the squire that saved him paint Blackthorn’s crest atop it in place of his own. He’d replaced the broken pauldrons and it gleamed brightly compared to the rest of his well worn armor. Anon had donned his usual llamahair outfit, but he was also now wearing a hat provided him by the King, also adorned with Blackthorn’s crest. The King opened a gate and they stepped through the shimmering blue portal one after another. The scene was chaotic before them; Guards, adventurers, explorers, and volunteers swarmed the streets, fighting the marauders and their monsters. Blood spotted and stained the streets of the city of Vesper as battles raged across the islands, the bridges barely holding up to the fury of the fighting. Anon quickly started chanting, and in moments he was teleporting with flashes of light from spot to spot. Dupre shouted after him “Damn it, Anon, we have to do this together! Let’s go!” He spared a glance to make sure the King was behind him, and they charged after the mage across the splintered wooden bridges. A satyr rose up in front of him, and Dupre drew the black blade out into a diagonal slash, and hacked the creature in half without facing any resistance. Dryad and Cu sidhe rose up to face him, and each one was dispatched with haste, leaving dismembered monsters behind them like a wake while they bolted towards the lighthouse. “I AM MORE POWERFUL THAN THAT PRETENDER EVER WAS! HE WAS JEALOUS OF ME, OF ME!” Anon roared back with fury at her even as he began to cast. “No, Councilor, we need to…” The King quickly tried to get Anon’s attention, but the mage was beyond hearing. “I NEED TO DESTROY HER!” And with that, Anon was gone, reappearing next to Minax in a bare moment. Pillars of flame exploded around him in an arcanic burst of fury, setting the entire roof ablaze…but Minax had already leapt down, and her whip flashed out, gripping Anon’s ankle and yanking him from his feet. 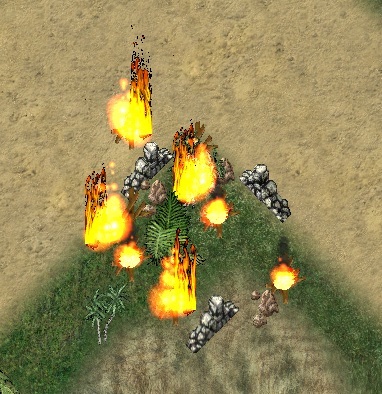 Anon screamed in his rage as he cast explosions out towards her, but she raised up a great wall of stone to block them. King Blackthorn turned back to the task at hand, looking at the ruined reagents…their original plan couldn’t be finished now, especially with Anon indisposed. He spared a glance back to the two, and then turned to the task at hand…and began to cast himself. Anon was still struggling with the Enchantress, but neither of them seemed to be able to gain a true advantage…until Minax led the fighting back towards a certain spot. From Anon’s angle he couldn’t see, but Blackthorn shouted out a warning that went unheeded by the furious mage. Shanty rose out of his hiding place with an evil grin, and his cutlass swung up. Anon shrieked out in surprise, a sudden panicked casting of teleport looking like he’d completely avoided it…but as he reappeared a few steps back blood was starting to stain his robe. Shanty stepped forward as Anon coughed wetly, trying to cast a healing spell…when Dupre ran from the alley Shanty had appeared from and slammed into the corsair, casting him to the ground. Minax snorted with irritation, beginning to cast at the knight, only for a wall of stone to rise up between them and protect him. Shanty turned with a laugh as he rose. “Wanna lose another piece o’ yerself, eh? Shanty’ll oblige yer!” As Dupre’s longsword clashed with Sharkbite, they smashed into each other powerfully, their enchantments fighting for supremacy. 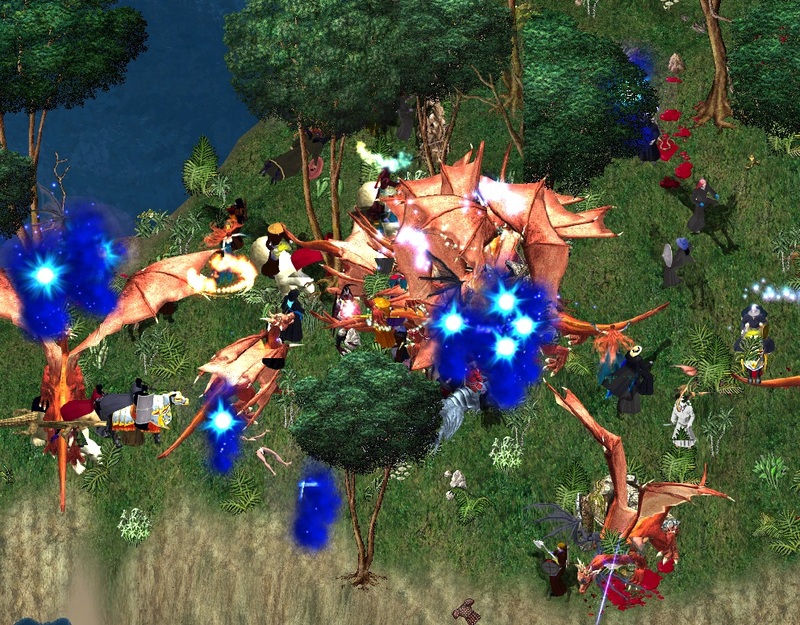 The fight continued to rage as Blackthorn focused all his efforts into the casting. He’d never get Anon back to what he needed to be doing, and Dupre couldn’t help him here. He felt the mana being channeled through his body as he tried to cast the spell Anon had created…but he couldn’t reach the threshold without the reagents. He heard a shouted warning and noticed one of the marauders coming across the bridge to aid Minax…and he no longer had time to worry. Drawing on his own area of expertise that he’d used against Exodus, and the feel of the crystal he’d brought with him in his pocket, mana surged and flowed through him powerfully. The words of power came out effortlessly, as if he’d done this a million times before; An orb of light started to expand from around him, slowly engulfing him…and the King was gone. As the light expanded and touched, it left the buildings behind…but as it touched Anon and Dupre, they vanished as well, as did the marauders and their minions. In moments all that was left was an empty Vesper, the explorers, the adventurers, Shanty and the Enchantress. Outnumbered vastly, the two fled in a burst of magical energy rather than face the wrath of their victims. “WHAT DID YOU DO? !” Anon shouted as he realized the extent of it, his voice echoing in the cavernous area. “I did what I could…because you abandoned your post.” The King said calmly, looking to the irate mage and hoping this wouldn’t end in conflict. “No it wasn’t! We could’ve killed them bo…” Anon’s shouts were cut off as he clutched at his chest and fell to a knee, his wound lancing pain through his chest. The King helped him up, even as Anon’s next words were more arguing. Sparing Anon’s wound a glance to see that it wasn’t mortal, Dupre sheathed the black longsword with an air of finality. As the mages walked away, he looked down the vast hallway…their argument was unimportant, as far as he was concerned. Ahead were tiny glimpses of what seemed to be each of the cities he was so familiar with. 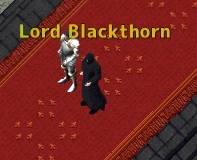 Then he turned and followed the two mages, walking out of Blackthorns Dungeon and Vaults. Wasting no time, he followed the young squire as fast as he could towards their destination…which became apparent in mere moments. In the streets ahead lay several bodies, and a ragged looking corsair was fending off three of his knights at once…an impressive feat in itself and worthy of recognition, but Dupre had eyes for only one person on the battlefield right then. Two of his other knights were wounded and bleeding through their armor as they staggered away, trying to get a moments respite…or possibly fleeing. A final remaining one hurled a purple potion at the back of a cloaked woman…who spun and caught it with her whip, and then with a flash of motion hurled it back at the remaining knight, sending him reeling as it hit. The dark-haired woman laughed, and the squire nearby said something, but it was all white noise to Sir Dupre as he charged for the woman in her studded leather armor and cloak. He sidestepped as soon as she started to talk and raised his shield, preparing to intercept a strike from the corsair, who grinned with a mouthful of missing teeth. The cutlass he swung left little motes of light behind it as it trailed down, and Sir Dupre instinctively turned his shield slightly…even as the cutlass hacked off a corner of the battered shield. Enchanted blade…powerfully enchanted, at that. He could see out of his peripheral vision now that Minax had turned her back to him, and though he ached to make her pay for that arrogance, the corsair pressed on hard. Sir Dupre parried the next blow and blocked the follow up, but each one sheared off either a piece of shield or gouged a nick into his blade. He attacked like a berserker, trying to keep Dupre on the defenseive, but finally the corsair made a misstep. Sir Dupre closed the distance, locking him in a clash of broadsword and shield against cutlass as they both pressed against the other and tried to overpower through sheer strength. The corsair’s breath stank of rum and decay as he laughed in the knight’s face, and Dupre pressed harder, starting to force him back. He could feel the man’s strength failing him, and it would only take one opening…knock the blade away from him and he’d be helpless, as lightly armored in leathers as he was…but just as he prepared to give him the final shove a crack snapped the air and he heard a crack and a tug as Minax’s whip wrapped around his plate gorget, and she started to pull. “Shanty, you said you had his measure…” Her voice was filled with irritation but a trace of amusement. With the Enchantress aiding Shanty, he weighed his options, gritting his teeth under his helmet…none of them were good, but at any second she could add her magical might to this if she grew bored with it. With a last shove of his shield, he flung Shanty backwards, and reared his blade to strike while Shanty raised his to block…a blow that Dupre never aimed at him. Dupre’s sword cleaved through the whip in a single stroke, and he raised his shield to block as a bolt of pure energy tore from Minax’s other hand, forcing him back a pace. He started to turn to meet Shanty as he caught motion out of the corner of his eye, but he already knew it was going to be too slow. 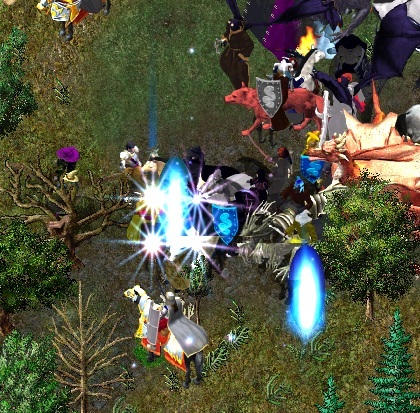 And then suddenly the Enchantress swore as an explosion went off, and then another; Dupre’s vision flashed with white as a massive lightning bolt exploded right next to himself and the corsair, weakening his attack just long enough for him to get his feet under him, and cast him to one side. As he rose to his feet, Shanty bolted…running straight for Minax and grabbing her, and both of them vanished in an instant after she cast a spell. Sir Dupre smiled inside his helmet. He’d watched two of his own armored knights flee with what looked like only minor wounds, and this unarmored squire had returned and attacked the Enchantress herself. It was only then though that he saw who the squire was accompanied by, and his smile died beneath his helmet. Standing smugly on the street with an air of sheer bravado was a man in a llama hair robe and cloak, who practically giggled with laughter as he saw Dupre’s stance go rigid. “I do believe that you owe me a debt of Honor now, Mister Shiny. 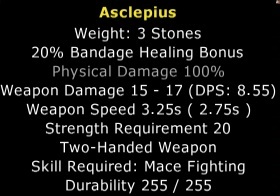 Or would you rather Halfblade after that performance? And here I thought you knew how to use those things.” Anon’s mocking tone inspired an anger in him that begged for redress, but he only gripped his broken weapon’s hilt tighter and finally sheathed it. “What are you doing here, Anon? I’ve no time for this…I’ve got wounded knights to deal with. If you want to gloat, go do it over at your Lycaeum with all your sycophants praising how wondrous you are while you chew your mandrake and cavort with…” Dupre’s words stopped as a man flanked by two guards approached, and Anon’s grin got even wider. “Ever the drunkard, I see! Shall we bring a nice winsome lass for you to woo and slobber over as well?” Anon’s taunts cast out after Dupre’s back as he walked towards the healers with the squire. “I’ll find a nice handsome mongbat for you in exchange, mage.” He could hear the Grand Councilor’s tittering laughs behind him, but ignored them as the squire led him on. [News] Revenge of the Enchantress. Brittannia, A beautiful world…..most of the time. Now I’m walking these lands as a outcast….wanted for treason by the crown! For years we trying to do good for all the people, and this is our reward. All of this because a impostor took my place as Governor of Jhelom at the governors meeting with the King. Stella still has faith that she still can solve the problem but we are loosing that faith. For years the Virtues guided us…..Maybe the time has come to leave everything behind! Maybe we need to look one last time around…. When I asked a town crier the news he gave me some disturbing news! I’m divided in my thoughts, The crown should deal with this problem….But part of me tells me to check it out. 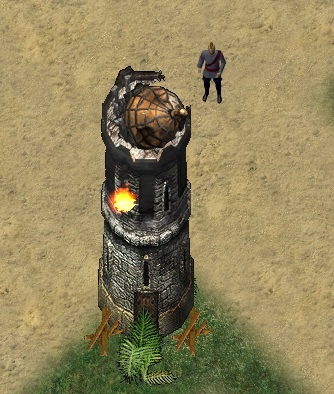 I noticed a strange lighthouse in the town of Minoc in Felucca. It looks like it was magically protected. I tried to damage with my sword but it was no use. 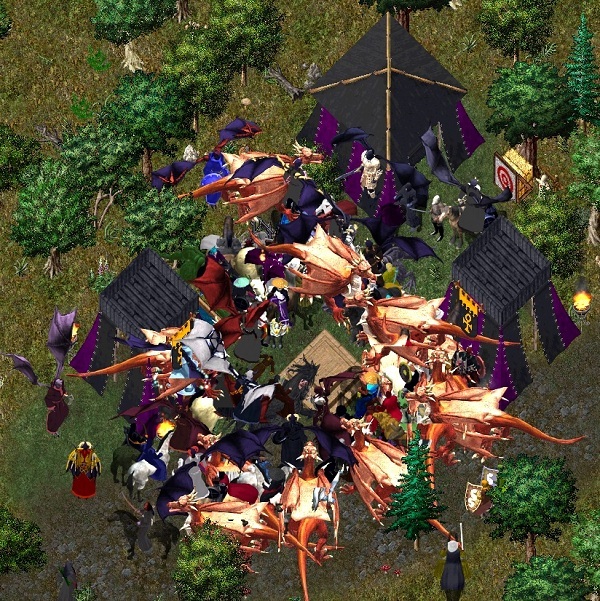 Then I noticed a group of monsters surrounding some sort of Captain. 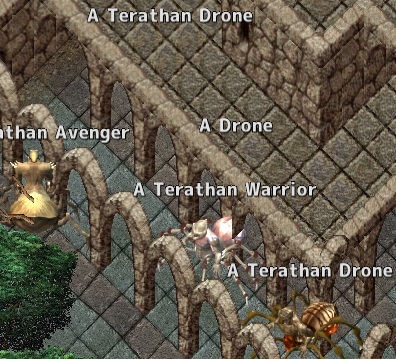 I had to kill them, I crashed into them and killed several. This Captain seems to be Master of his elementals, He seemed to be well protected , you could say Invulnerable, as long these elementals are protecting him. The elementals died fast but although I was able to notice that the captain was not longer invulnerable, he was still a very strong opponent. I felt I had to retreat until I know more of this invasion. I went to check out the Invasion in New Magincia in Trammel. Again i saw the strange lighthouse but different kind of monsters here. It seems to be some sort of Nature creatures. Again they were protecting some Captains. 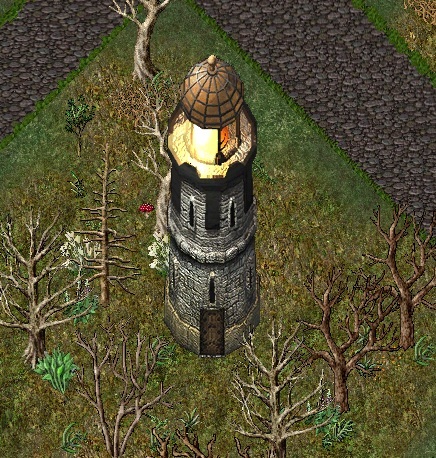 Maybe they had something to do with the lighthouses. I had to kill them! It took all my skills and my best tactics to defeat one. 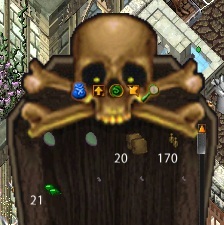 After checking his corpse I found a strange bow. I could not believe my eyes when I noticed the Crest of Minax on it! I had to kill more of them! I fought my way through the town and killed as many I could. After killing several Captains I noticed the magical field around the lighthouse was gone. I started bashing at it and it started to crumble. But after some time I was pushed back and the magical forcefield was returned. Now I understand that the Captains and the lighthouse forcefield and linked together! We had to kill more Captains to take the field down. It was a lot of work but after defeating dozens of Captains we were able to destroy the lighthouse. The town was save again, maybe this was my last battle I had fought, I dropped my sword on the ground….But then a friend came running to me. “Governor Frarc! Britain is under attack! Please help us!” he said. He picked up my sword and said they needed me, no matter what Lord Blackthorn said, that we are traitors. How can I abandon my friends? I nodded to my friend and told him to warn all Governors, Citizens, Friends and Allies, We will fight together to stop these invasions! Together we will fight to save Britannia again! We will take the risk to get caught and be arrested but maybe i can proof that I’m no traitor to the kingdom! 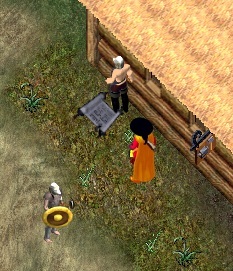 After a long battle I went back to Jhelom and talked to my Sheriff. I gave him the bows with the crest of Minax on. 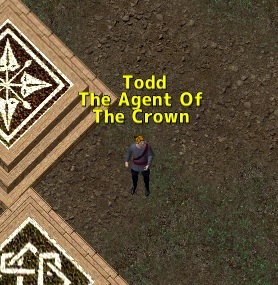 I told him to find a agent of the crown, I know there is one in every city. Maybe the agents of the crown will know what to do with these weapons. 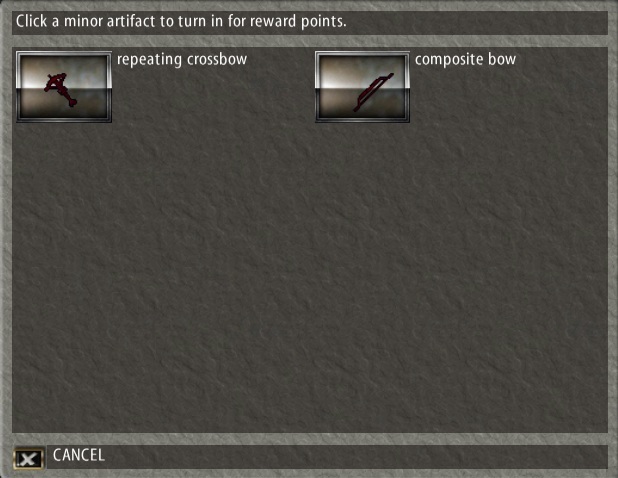 Maybe if we are lucky, the people who turn in these items will be Rewarded. I need a meeting with the other Governors, We need to work out a battle plan! Comments Off on [News] Revenge of the Enchantress. My spies informed me about that a coronation of a new king in the world above in Blackthorns castle. Maybe it was time to show me again to the people who defeated me, as far they know i am death. Months have passed since Jigsaw brought me back on Fire Island and i had plenty of time to regain all my strenght…..and more. A attack on a professor was good to start some trouble but killing a new king would make me infamous! The fear and hatred from a assassination like this would give me even more power. To come this close to a king i need a good disguise, my cloak of death can hide my appearance a little from the guards. Its also perfect to hide my deadly dagger in one of the sleeves. And i will take this old chaos shield with me, maybe this foul them enough to get inside. When i walked over the bridge that leads into blackthorn castle i passed several guards. The shield seemed to work to walk by these foolish guards. Its been a long time since the last time i was here but the castle have been changed a lot since then. 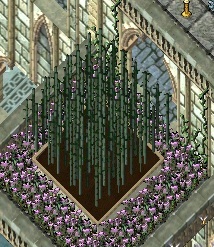 A huge statue of Blackthorn in the center of the castle. 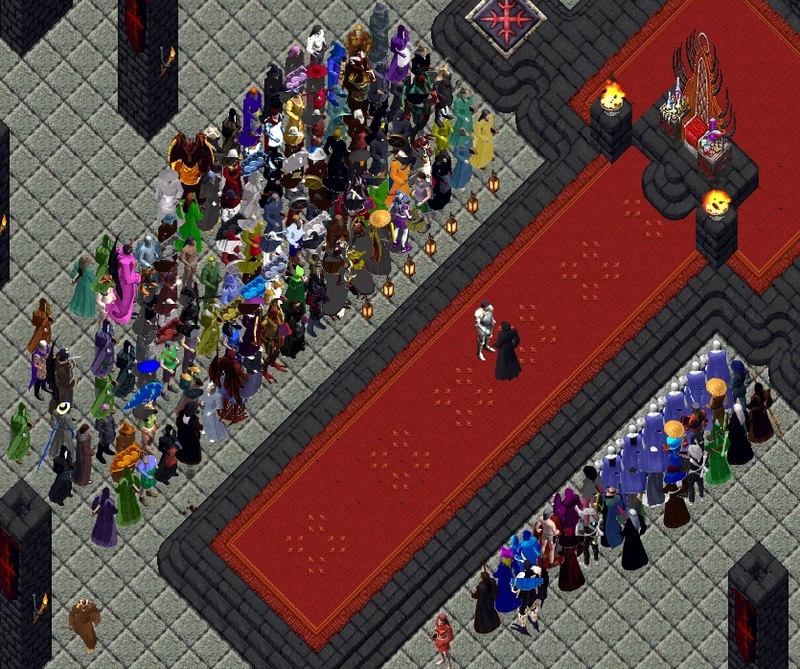 I followed the many citizens inside the castle and found myself shortly in the throne room. So many people came to witness this coronation. I will just stand in between this crowd and strike when the time is right. A Paladin appeared, it was Dupre! “Fellow Britannians! For some time our great lands have been wrought with Strife. Whilst I battled fiercely the Sorceress Minax and her forces in Felucca, I watched as the land of Trammel was left to its own divide. Cities tore away and the nobility ignored the peasantry in the absence of a Crown. Taking advantage of this distraction the vile Exodus, freed through greed, tore the lands of Ilshenar asunder. Many of you stood by my side as we valiantly defeated the Demon. But with its death a darker and more sinister evil was released upon the Honor Moongate. Trouble would not end there…displaced from their native Ver Lor Reg, the Gargish faced a deadly plague with no hope for cure. Then I heard news from a tiny fishing village in Ter Mur. And just when I thought mine ears had been deceived before me stood Lord Blackthorn, but not as a twisted clockwork beast…but as I once knew him, diligently assisting the afflicted gargoyles. News travelled quickly of his return and before long his healing would once again be our savior. In a spectacular display of the arcane arts the evil that had shattered the Honor moongate was purged and the Moongate was once again restored to its brilliant blue. It would seem things in our world occur in threes, and so is the case with Blackthorn’s return. There he was… Lord Blackthorn himself… this was my chance….but….when i looked around the throne room i did not just notice supporters of this new king…. i saw some old Lord British guards too. Not everyone seemed to be happy with blackthorn as new King. And i did not see several knights of Virtues….Maybe they don’t accept this new King, after all he still wears the sign of chaos. Maybe killing him now is too soon…. maybe i can use this conflict between the humans to start some trouble. A new war between chaos and order would benefit me and my master. “My Lords and Ladies, for too long has Britannia been without proper rule. For too long has Trammel been without guidance. It is clear from his actions that this man is not the deformed evil many came to know, but instead our hope for the future. “I humble accept this great honor and pledge to protect all citizens! We want to thank the people for their confidence and prepared you a little gift! Before i stepped trough the moongate i had one last look at the new King. I don’t know if this King is ready to bring his people into brighter days but i know i will do anything in my power to prevent that. He is the Lord of Chaos…. and chaos is what i will bring to these lands.. 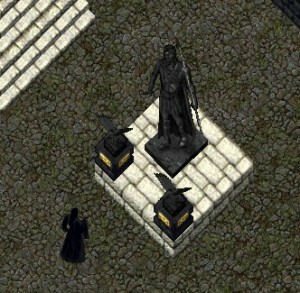 When i traveled trough the gate i found myself near another huge statue, when i touched it i received a deed for a replica of the Kings throne. I will tell me slaves to build it in our own throne room. It will perfect when my master returns to take his rightful place as ruler of Sosaria. Comments Off on [News] The Coronation. I want to give you my sincere thanks for the help you gave. Now it’s time to do the next step. I call all of you to help me with another issue which needs to be solved! If you want to know what it is all about, please visit me in the quarantine village in Ter Mur (88°30°S; 2°15°W) coming Sunday. A Moongate will be provided from the west bank of Britain. A letter from Lord Blackthorn himself asking us for help? To be honest i don’t trust Blackthorn myself but like many other people i was curious what he had to say. 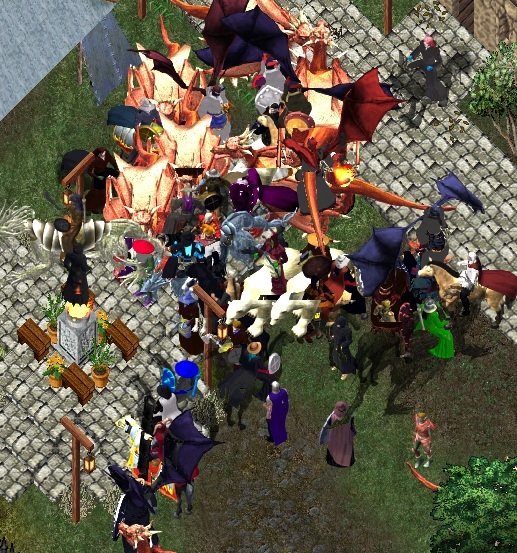 Many gathered around the West Britain Bank for the gate. Right on schedule a gate opened and took us to the Quarantine area in Ter Mur. There we found found the Lord himself. 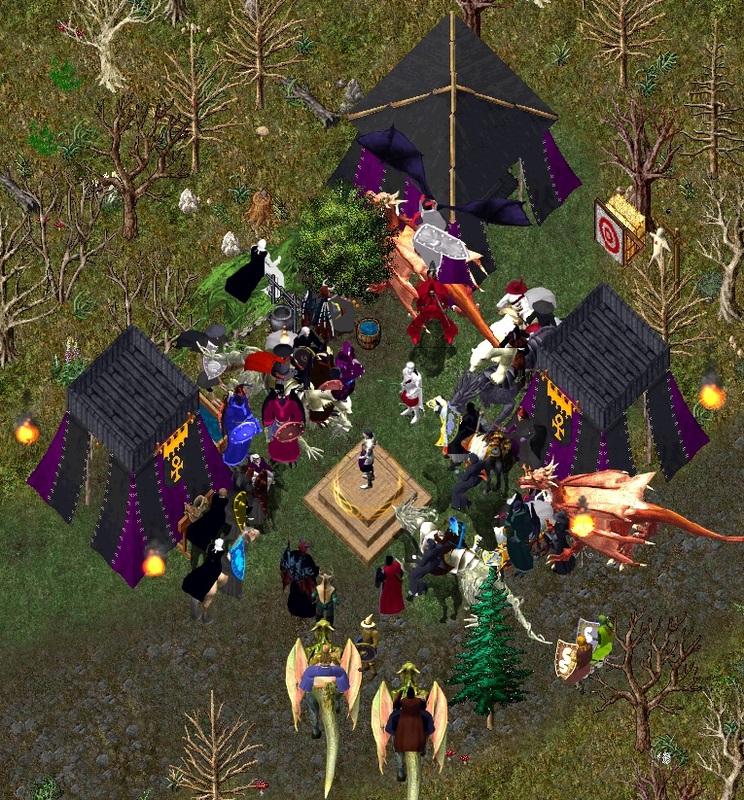 There was a large crowd ,Blackthorn looked for a place to stand up so he could see everyone. “Dear Folk of Drachenfels,today is the time to do the next step. Today we came together to repair what needs to be repaired. Today we going to repair the Moongate which was destroyed after the fight against Exodus! I know a powerful magic which is able to rebuild the Moongate. But to wave this powerful spell i need your help! That’s the reason why i called you! 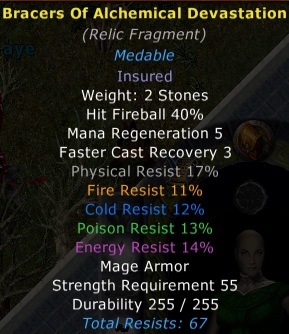 There are four rare reagents which that i need. 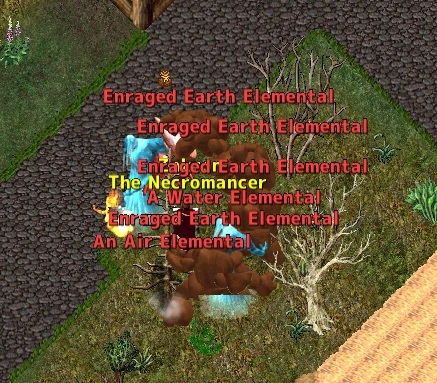 These reagents are obtainable on several places on Sosaria. To get the reagents we need to fight and slay four different creatures which carry these reagents in them self! It could be dangerous a,d i can’t guarantee that you come back healthy! Now i am asking you all! While Blackthorn looked around most of the crows yelled yes! I will help too… but not for Blackthorn… to help Sosaria. “I knew the folk of Drachenfels is brave! Let’s don’t waist more time! The creature we going to search now has a strong magical scale! A gate opened and took us near the entrance of Covetous. 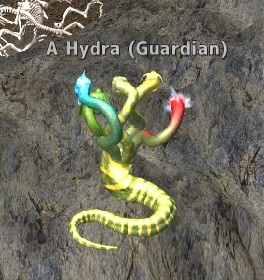 Several Hydra’s attacked us from a passage in the mountain. It was easy to fight this narrow passage so we had to lure them out. When all hydra’s where slain Blackthorn cut of a piece of scale. “That was not easy, but now i am able to take the scale. And so we have our first reagent. 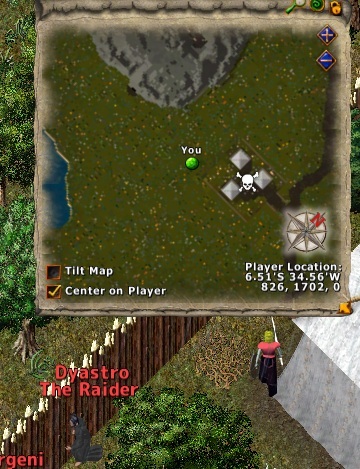 A gate opened again and we found ourself on a island west of Buccaneer’s Den. Skeleton Liches where waiting for us on the island. It was not easy to fight on this jungle island. Not only we had to deal with the skeleton liches, also some big serpents. It took a bit longer then the Hydra’s but we killed all of them. 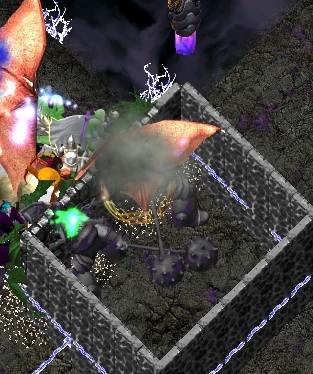 We need to go on fast, course as soon the reagents are out of the body of the creatures, they start to loose their power! The next creature has an eye,which is one of the most powerful eyes on Sosaria! A gate took us now Malas near the arena. Several big spiders came from the west. Inside the arena more spiders crawl from all direction to us. It was not the first time we had to squash a lot of bugs! “We obtained it! Very good! Now we miss the last reagent! This reagent is the most powerful of all! And of course it will be the most dangerous to obtain! We need the heart of one of the strongest dragons on Sosaria! Only a second when we stepped out of the gate we all knew this is was going to hurt! 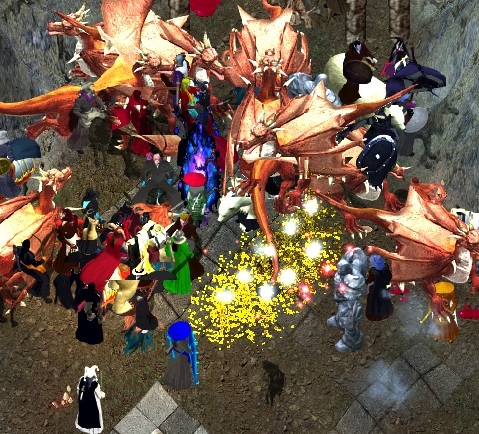 We found ourself face to face with several Crimson Dragons! This was one of those days i wished i was just a fisherman! 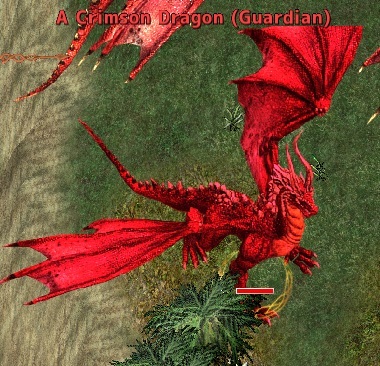 After a long and hard battle the last Crimson Dragon fell. “That was a real hard and deadly fight! But you are the best fighters of Drachenfels, we were able to win! Now I have all what i need to prepare the magic spell! One last gate opened and we found us standing near the broken Honor Moongate in Ilshenar. Blackthorn started to cast the spell. It was a long spell that went several times around us towards the broken Moongate. But eventually after a big explosion the Moongate was repaired! All was back to normal now. We were able to repair the Moongate! For today we did enough! I need to get rest! 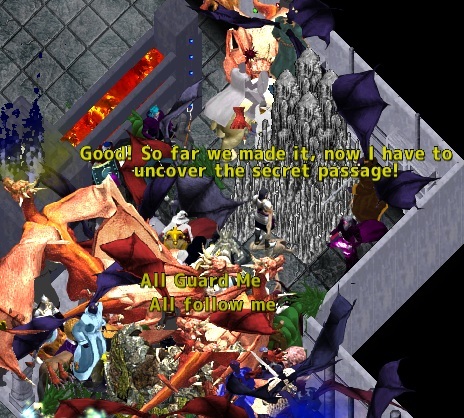 Everyone slowly left trough the repaired Moongate. I had one last look at the gate, feeling pleased the gate was repaired….. but i can not understand that it was done by Lord Blackthorn… Someone i still not trust. For now i stay vigilant, the future will tell, i will let the Virtues guide me! New Frarc, Drachenfels News reporter. 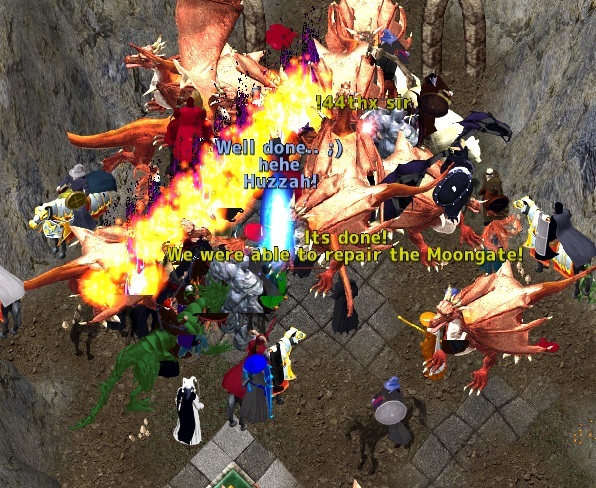 Comments Off on [News] Repairing the Moongate. The day came when the last cure have been turned in to help the sick gargoyles. The alchemists that spend hours and days to make these cures have not been forgotten. 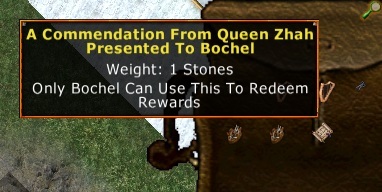 The Mysterious Healer handed them a commendation from Queen Zhah. 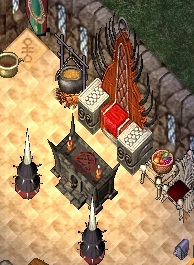 Depending on how many cures the alchemists made for the mysterious healer , they where rewarded with several items. These hard working alchemist can be proud what they did to help the gargoyles! Lets hope that these cures can now save many lives! Comments Off on [News] Rewarded. 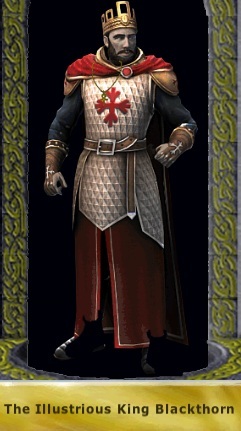 I was traveling around in Jhelom, the town i declared my loyalty too, when the captain of the guard came up to me. 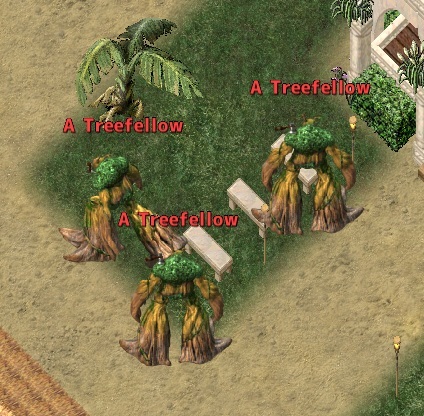 He ask if i could help the town a little more with rebuilding it. 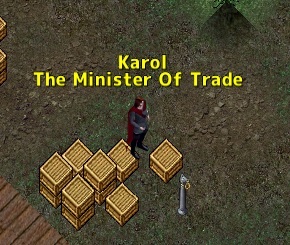 He told me to seek out the minister of trade near the docks. 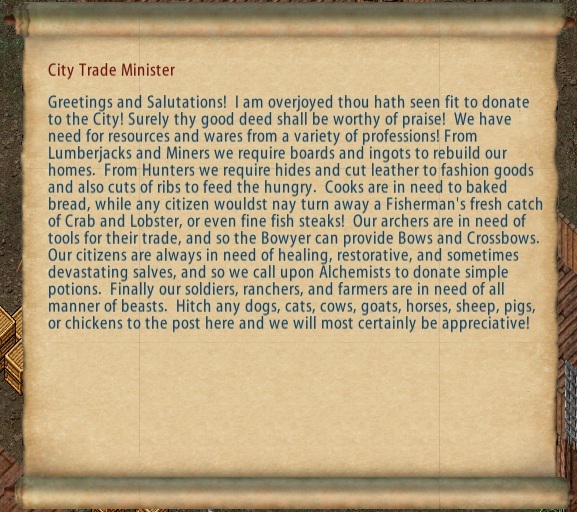 The minster ask me if we could help him with gathering him with supplies that the town desperately needs. They told me that all towns have a minister of trade to help the towns in need of help. 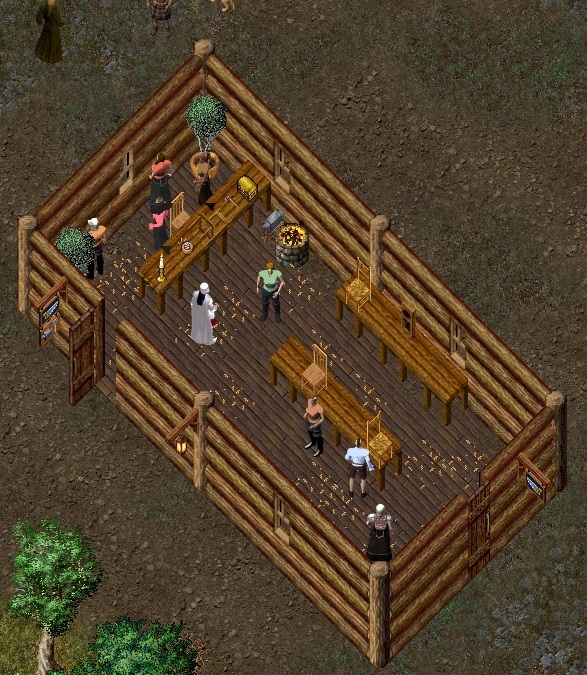 Jessica Goldfox went to help in New Magincia and started to supply them with some cows. Her help was greatly appreciated. Sybille Scrible went to Trinsic with a load of raw meat. Her town loyalty to Trinsic will be increased if she keeps helping the town. My friend Bochel when to turn i some Bulk Order Deeds in Minoc. And with helping the craftsmen with their bulk orders his standing in Minoc was raised. Tommeke Beans had talked to the captain of the guard and explained he was more of a fighter. 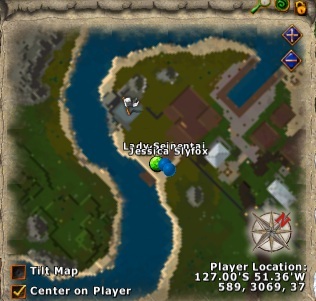 The captain understood and told him that if he would fight in the champion spawns in name of the town that he could proof his loyalty to the town too. Tom smiled and took his bow and traveled to the nearest champion spawn. My scouts reported me some new establishments in a few towns. Sand in Ya Britches Tailor Hut and “The Sandy Smith in New Magincia. The Elves Thimble in Yew. I need to speak to more friends and family to see how we can help the cities. We have discovered that the Raiders have been hiding in a camp between Britain and Yew. 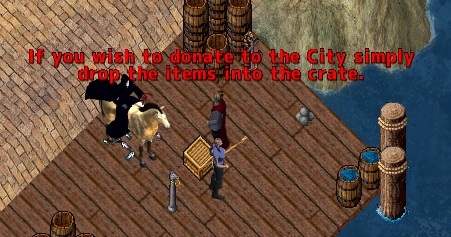 Grab a rope from the Captain of the Guards chest and arrest them to bring them to Justice in your town. Comments Off on [News] City Loyalty. 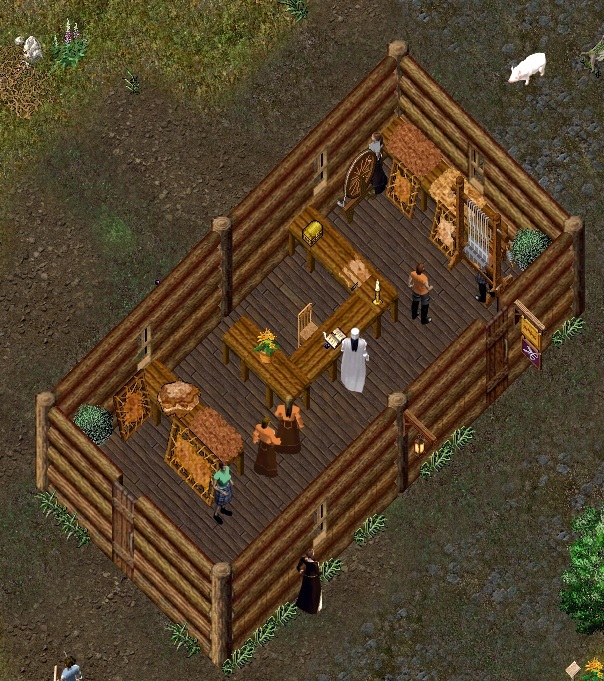 I heard a rumor about a new camp been build at the fisherman village north of the Royal city in Ter Mur. When we arrived at the camps we saw this disturbing sign at the entrance. I had to go in to see what was going on. What i saw was very disturbing! I noticed some very sick gargoyles walking around the camp. Inside the buildings there where a lot of working places that where set up as a alchemy workbench. Looking trough the camp i saw mysterious person. When i came closer he asked if i could help him and gave me two books. I started to read the documents the mysterious healer gave me. I am overjoyed at your willingness to assist these afflicted gargoyles. It is without question that your action are virtuous and I commend thee. Fortunately I have been able to work out the basic reagents needed in the preparations of the cure. Firstly you will require the Cuticle Sac of a Terathan as a binding agent. These can be found on Terathan creatures within their keep on the outskirts of Papua. Secondly, to combat the foul taste of the preparation you will require vanilla. 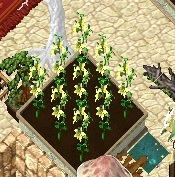 Vanilla can be found on various paragon creatures in Ilshenar, or those with a green thumb the raw plant can be cultivated from seeds found on creatures deep within the Exodus dungeon. Third, in order to create the necessary solvent to dissolve the healing attributes of the cure you will require Raw Yeast. Raw Yeast is often carried by Orcs as a common cooking ingredient in their foul tasting breads! Fourth as sustenance for the Raw Yeast you shall require Sugar. 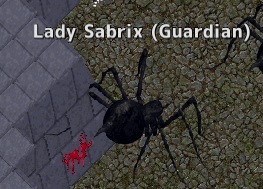 Sugar can also be found on Paragon creatures in Ilshenar. For the horticulturist raw sugar cane can be cultivated from seeds found on Juka Magi,Kappa, or Plague Beasts. 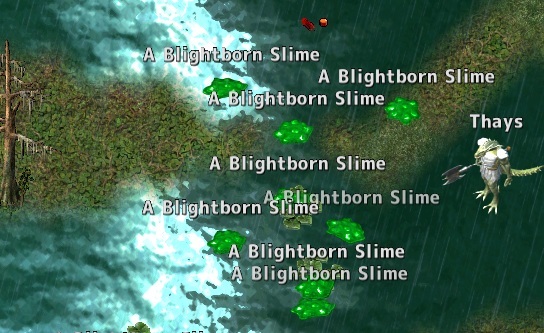 Finally, you will require Blightborn Slime as a means of building immunity to this horrible blight. 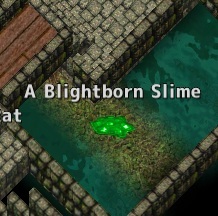 My research indicates the slimes occur naturally within the depths of the Britain Sewers. And the swamp south of Destard. 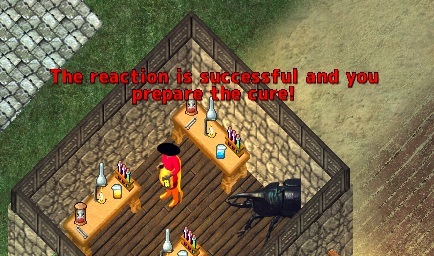 Once you’ve collected the reagents your task is to assist the the preparing the cure. While the reagents necessary will always be the same, the combination in which they are to be used changes with each attempt at the reaction. Succeed in determining the combination and your reaction will yield the cure! Turn in your prepared cure in to me so that I can see that it is delivered to those afflicted . 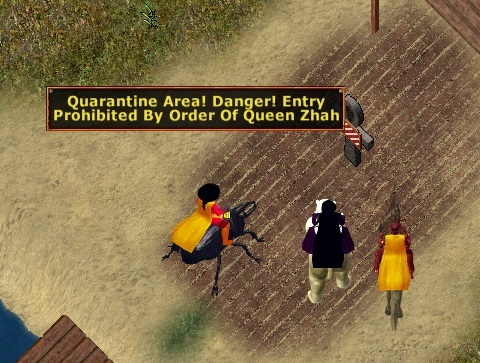 For your assistance in this matter Queen Zhah has authorized unlocking the Royal Vault and as such should you be among those who turn in the most cures you shall be eligible for reward. I thank thee again for your assistance. Only together and united shall our effort result in success, so that we may see the end of this horrid Blight! I know now what i had to do. When i got home i send out several of my friends to the location to collect the ingredients and i asked Scorpio to start growing a lot of Vanilla and Sugar as he can. It is a good thing he already stocked up a big load on them. 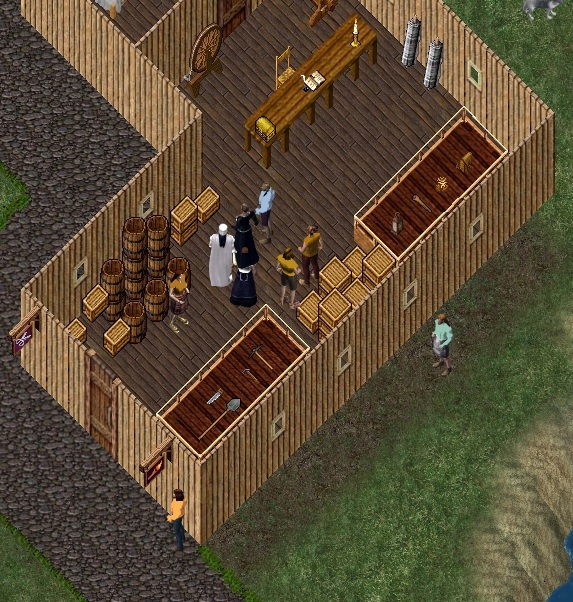 I talked to several Grandmaster Alchemists to go to the camp side to try to make the cure. 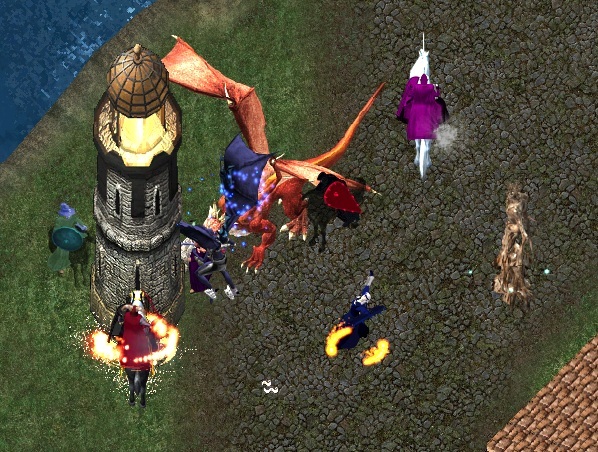 Bochel, Jessica Slyfox and Seinentai gathered the reagents they had and traveled as fast as they could to the camp. 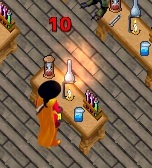 They all took a place at one of the alchemist workbench. Before they started they read the second book i had received. Once you have collected the necessary reagents you may attempt to decipher the combination of each reagent necessary for the cure. To begin your work visit the makeshift laboratories setup in the buildings here. There, you will find a laboratory bench. Of particular note the Flask, Heating Stand, and Tongs. 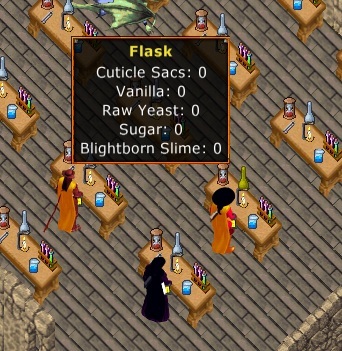 To add reagents, double click the flask. You may add up to three of each reagent, and must add at least one of each reagent. To empty the flask and get back the reagents added, double click the tongs. When you are ready to test your combination use the heating stand. You will begin the heating the contents and the numbers of correct reagents will be returned to you. With each guess the reaction will become increasingly unstable, until ultimately if you do not succeed at preparing the cure, the reaction will catastrophically fail. The combination of reagents changes with each success , and each catastrophic failure. The alchemist knew now what to do and started to combine the reagents. At first they had no idea what combination would be a good one. It looked not easy to find the right combination. 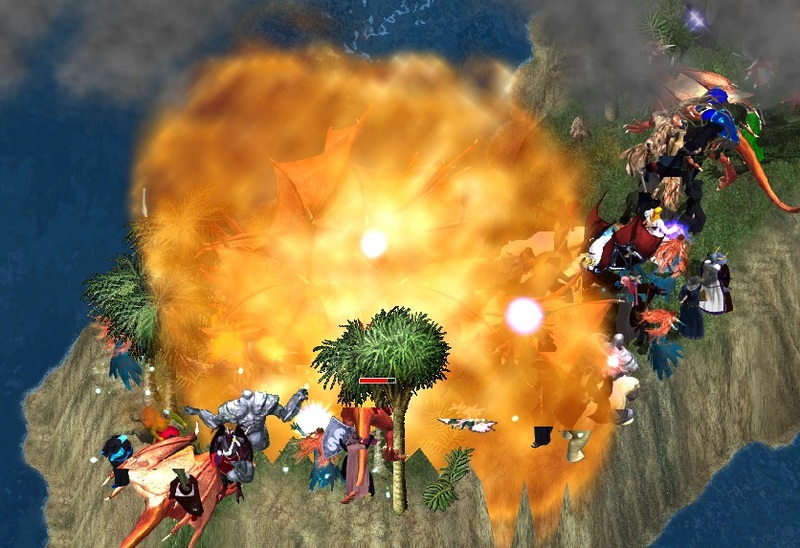 Several flasks even blew up in their faces. But my friends new that many lives dependant on their knowledge of alchemy. Step by step they came closer to the right combination. A combination was found and poured in to a bottle. Bochel ran to the Mysterious healer to give him the first bottle of the cure. 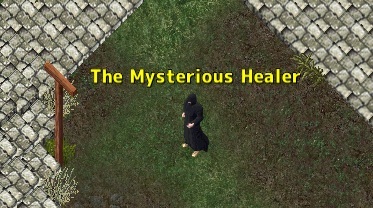 The healer was very happy to see this cure! This was just the first bottle of many needed. I will send all my friends out to gather as many reagents they can and ask my alchemist friends to work on as many bottles of cure they can. Comments Off on [News] The Cure. 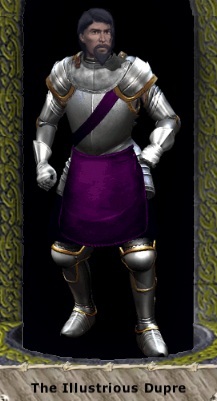 It was time to join Lord Dupre to fight and free Ver Lor Reg from the mechanical monsters. It took only a short time before a army gathered around Dupre’s tents. All of them were armed to the teeth and even the teeth were armed! Ready to join Lord Dupre. Today we going to free Ver Lor Reg from all evil! I am happy to see so many of you here. No more words! Let’s go to reclaim Ver Lor Reg! No Mercy! We have to kill all enemies, without exception! A gate opened and took us to the Center of Ilshenar near the steps to Ver Lor Reg. We could not take the stairs to the town. We had to go around trough the exodus dungeon. We fight our way trough several minions . At the west side a wall blocked our way. Dupre told us to take it down. There was a secret passage that would take us in the city. Dupre uncovered it so we could make it trough. The town or what was left of it was completely changed. It was changed by the mechanical creatures. Walls blocked our way, Dupre ordered us to take them down. We had no idea what to expect when we go trough the wall. More walls where blocking our path. We could hear sounds behind these walls. We had to get trough them and kill whatever was hidden behind it! One by one we took down the walls and killed all the mechanical creatures. Everyone fought really well and it seemed that this battle would be over before we knew. It was a bit easy…. maybe too easy. When we thought we had kill every mechanical creature a loud roar came from behind me! 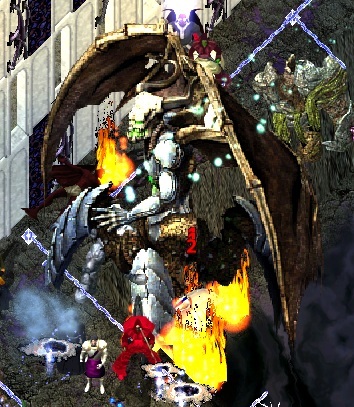 I looked back and up and saw this huge half daemon half mechanical monster standing above me. I saw the fear in the eyes of my friends around me. This was not looking good! He took a swing at me and i tried to block him with my shield. But the force was so hard i flew several meters back trough the room. Never have we encountered something this powerful. I had so much pain, it was like every bone in my body was broken. 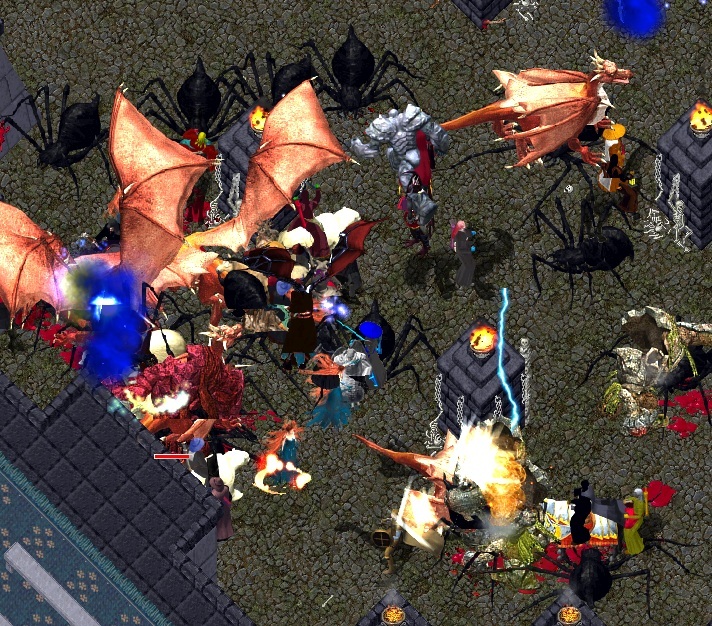 A rain of spells fell from the sky and i saw people dieing all around us. Would this be our end? My friend Alia picked me up, “Get on your feet ,Knight!” she said. 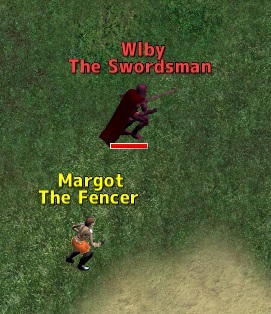 She kept shooting arrows at him while she was helping me. 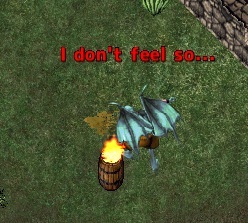 I looked around me but no matter how impossible this fight seemed to be, tamers kept sending there pets on him. Spells and arrows kept flying around. Everyone did what they been ask to do, defeat this evil! We had to stop him now! 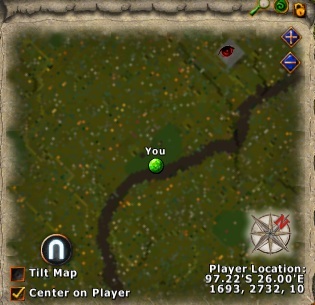 This was the hardest battle we have been in. But our persistence was bigger then the fear of death. And after a while we started to get the upper hand. We can defeat him … and we did! When Exodus fell you can hear the cheering all over Ver Lor Reg! Lord Dupre was pleased to see this great victory. We where rewarded with a scroll of valiant commendation. 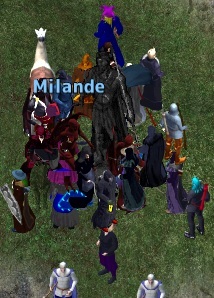 Dupre took us back to the Honor moongate of Ilshenar. -“Very well, we killed Exodus! We all got a copy of the journal. -“We achieved a great victory today! I have to thank you all for this! The time has come to return to Britannia! 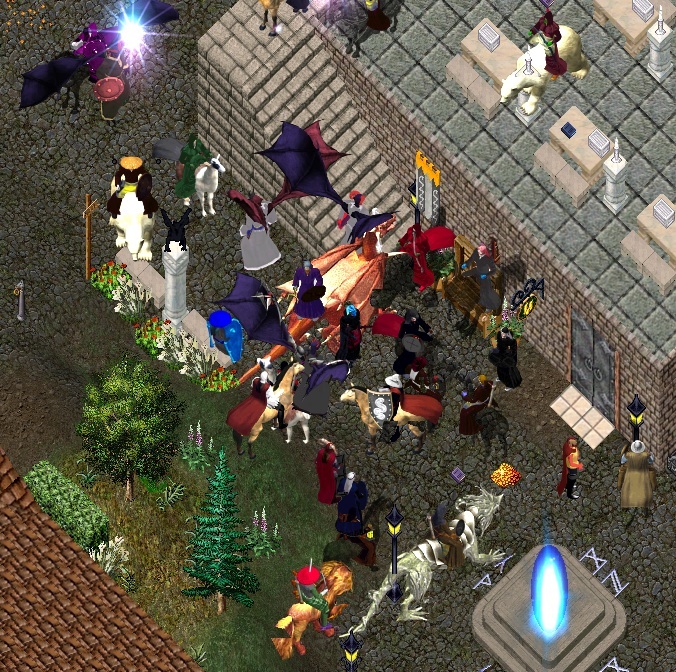 But when Dupre wanted to enter the moongate, something very strange happened! -“What happened to the moongate? For sure it has to do with the death of Exodus! 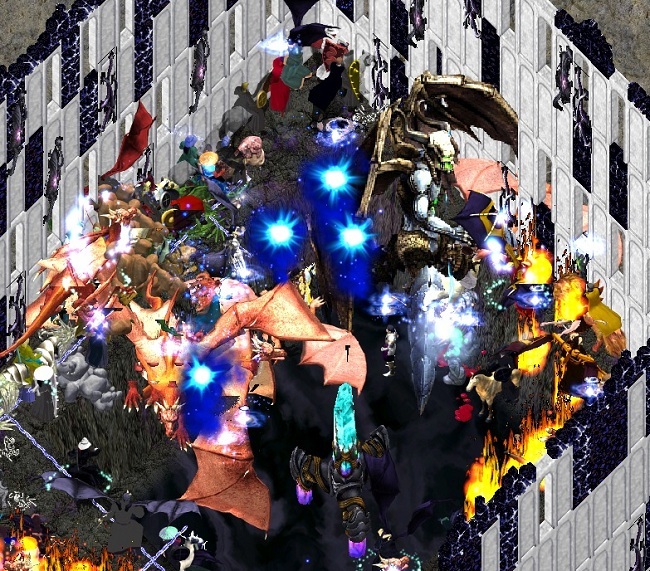 The energy streams which we provoked with the death of Exodus corrupted the moongate! 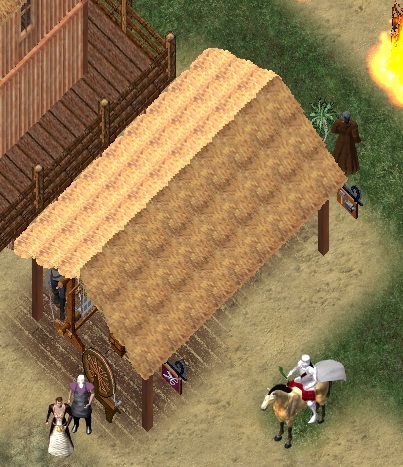 Dupre took us out of Ilshenar with a gate to his camp. After thanking us all again he left to get some rest. 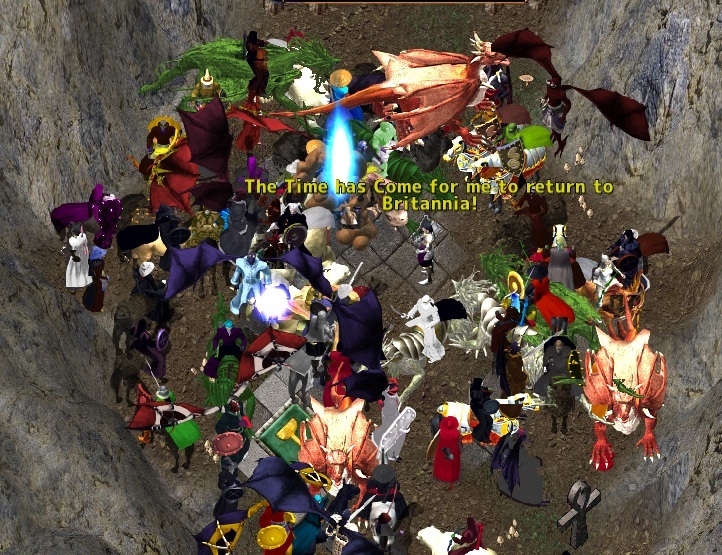 We all had to go home and rest after this hard and long battle. But i could not sleep before i read this weathered journal. *This journal appears to be ancient, and has many gaps throughout; Only a handful of entries are still intact, and they seem as if they may not even be in order haphazardly written. * It vexes me greatly that even now, in my friends absence, still the throne has not been rendered unto me as should be my right. It is not as if I expect to hold the position forever, but in the absence of Cantabrigian someone is needed upon the throne to hold the realm together. I fear that if there is no ruler, that we shall fall like chaff and Ive yet to see any others who think themselves capable as rulers; perchance it is only a matter of time but as I’ve written this waiting vexes me. 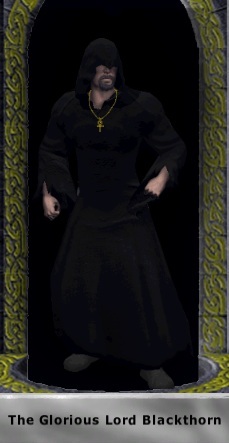 In the course of my friend’s quest to reunite the shards, despite my misgivings about his plan and all the consequences it entails, I felt that it would be entirely idiotic of myself not to perform more research upon some of the magicks that Nystul and Cantabrigian’s claim will be utilized. Much of it seems somewhat similar to Gilforns research, but he prattled on about using my connection with Cantabrigian to try and force Nystul to tell him everything he knew. It seems that Nystuls distaste for me is more of a private matter than I imagined, or Gilforn would probably not have bothered asking. A few assurances that Id try however, and he told me more about moongates and the teleportation technology than anyone but perhaps Nystul and the Stranger know. He was particularly interested in using moonstones in the process of creating permanent moongates. I feel that had I continued to ask questions, he may have spoken to me until both of us died of old age; I wonder if he is not obsessed over it in the same way that Anon is with those mongbats of his. Hopefully Heckles has had some success with speaking with Chuckles about the current state of things with Nystul, and if not, I can at least send him to the Lycaeum to pick up some more research materials for me. This new land that theyve discovered could hold untold levels of power, but its most peculiar that it already contains shrines to the virtues and even a shrine to the idea of Chaos. Imust admit that I am at a loss as to what to make of such a thing. I have theories butis this Ilshenar the ruins that is left of a Sosaria, fallen prey to ever escalating fighting between the zealous forces of those who followed my philosophies and those who followed my friends? A world where Chaos was incorporated into the virtues? Or a place that somehow, by its own means, came to the same virtues we have and the idea of chaos entirely on its own and developed? Or could it be something even more fantastic than I could possibly imagine? I find myself stricken at once with anticipation and anxiety, curiosity and dread, and while I hope that this land will hold enlightenment to a great many thingsI fear that like our own, there may lurk untold horrors within its depths. I have discovered somethingsomething drastic and terrible. A creature that goes by the name Exodus. I can tell that its power is familiar to me, and it reeks of Minaxs power and yet is subtly different but worse, I can sense just how powerful this Exodus is. Without Cantabrigian here I dont know who I can trust with this information; Nystul and Dupre have rarely ever been fond of me. There is a possibility though if only I can secure what I need. The creature thinks itself powerful enough to offer me Sosaria under my rule…but it means to do so by conquest. Any who read my political call to anarchy would know that freedom is something I believe all should have and exercise but I think I can convince this monstrous being otherwise and perhaps by tricking it, put myself in a position to stop it. I have already led it to believe I will return to it and allow it to place me into a different body some hideous amalgamation of flesh and machine. It then returned me to my own castle to prepare myself for conversion, but I know what I have to do. 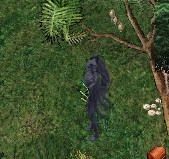 I dont have much time as the creature expects me to return or will spirit me away again at anytime; at great expense and effort I managed to trace the flow of the spell used to summon me and correlate it with Ilshenars known geography to locate where this creature seems to be drawing power from. By removing or destroying this area, I should render it incapable of such feats, but I have no idea how well it can detect these things. In a position where all choices are fraught with danger, I can only choose the one that presents the least to the lands even if it may present the most to my own person. 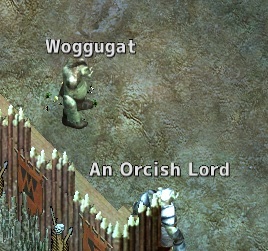 I may not be as powerful a mage as Nystul, but I have not let him far surpass me either. 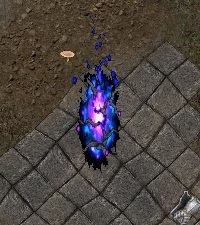 Gilforns ideas of moonstones, perhaps combined with blackrock and my own abilities its possible. It was difficult to obtain blackrock, but Heckles didnt fail me and nor has he ever. I hope that he realizes how essential his services were. If I cannot eliminate Exodus entirely and still have access to the blackrockthen I will destroy everything I can to prevent it from manifesting. Comments Off on [News] Call to Arms! We where a bit surprise to hear that Lord Dupre himself wanted to have a meeting with us to plan to retake Ver Lor Reg. 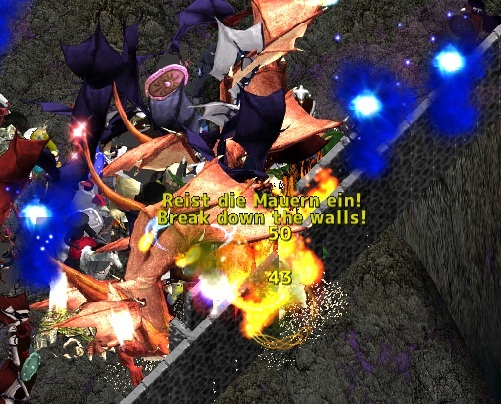 Mages casted several gates from Britain, Luna and the counselors hall directly to the camp. We where curious to hear what Dupre wanted from us. A large crowd gathered around the camp when eventually Dupre appeared from out of one of the tents. It was for the first time many of us met this legendary warrior. The people went silence when Dupre started his speech. 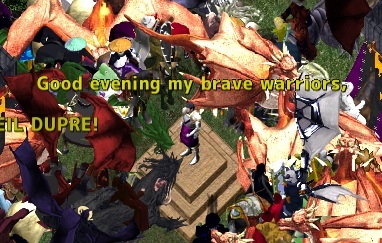 I am proud to see many faithful warriors here! 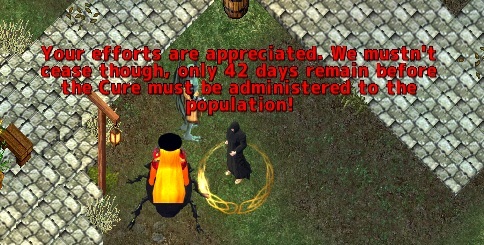 These days Sosaria is an unsafe place. But now … With this gathering we build the axis against the evil! but after a few days of scouting I am sure we can handle this! With your help we will be able to get the evil out of Ver Lor Reg! My plan is to attack the enemy next Sunday at 20:30 CEST! We will meet here in my camp next Sunday at 20:30 CEST! I will instruct my mages to provide the same moongates like today. Please try to bring as many of your friends as possible. I expect anyone here who is able to hold a weapon! The gender and the age do not matter! 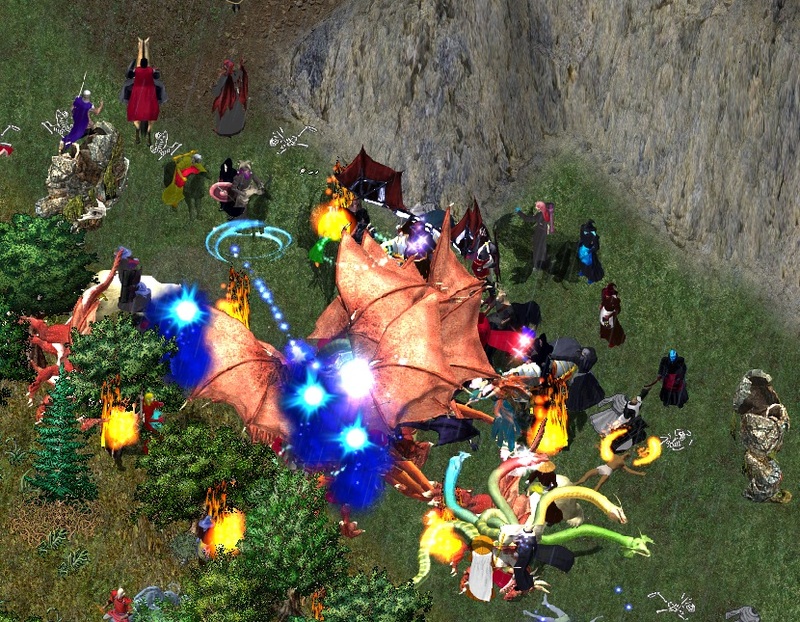 For today we had enough about the war and the bad proceedings on Sosaria! 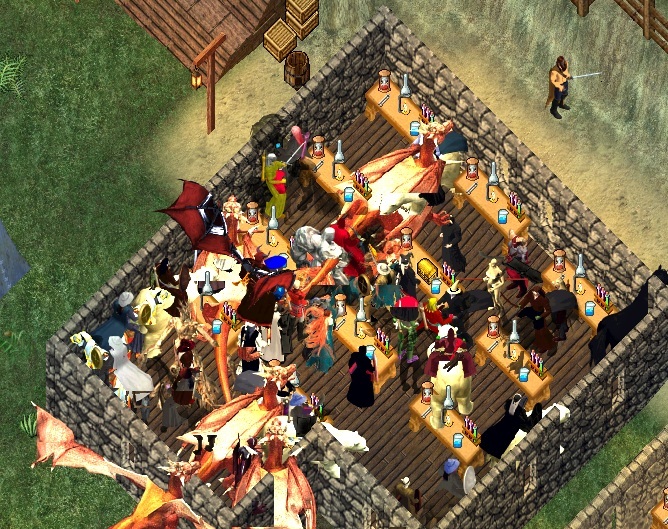 now it’s time to celebrate the gathering of such honorable folk! Dupre passed around the ale and meat but some of us had questions..
What to expect to find in Ver Lor Reg? Ones again we all facing a hard battle…. and i fear several of us won’t return after the fight. But we have to fight and free Ver Lor Reg…. or die trying…. After all the questions been answered Lord Dupre thanked us and left back to his tent. We better rest well and prepare ourself for next Sunday! Comments Off on [News] Rallying.